See also Apple Support: Switching PC Habits. Let’s use the Fibonacci sequence as an example. I wrote six different versions to calculate it. Obviously the naive, recursive way of calculating it is the slowest, but that is where similarities between browsers end. Internet explorer seems to be faster at looping than rounding numbers. And Chrome seems to favor local variables over global ones so much it doesn’t mind doing a lot more calculations. Update: This seems to be fixed in Explorer Platform Preview 1.9.7766.6000. As I’m still learning ASP.NET MVC, my solution may not be the optimal one. After seeing the Silverlight Chess sample I immediately started work on a flash version. It needs a lot of optimizing, not a single variable type was set, so it’s not a very fair fight. 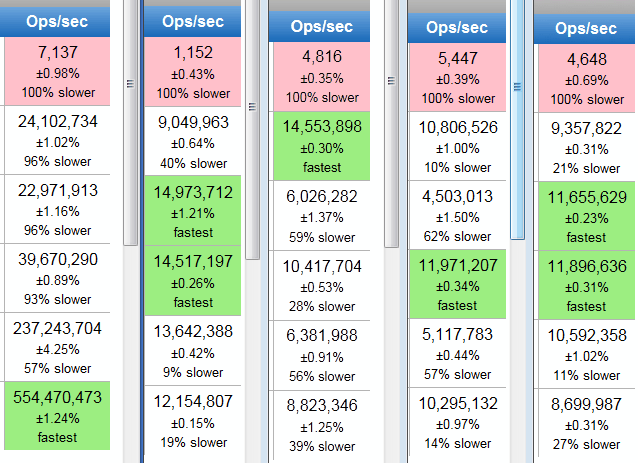 Anyway … flash is about 10x faster than the ie7 js engine on my machine. But still a lot slower than silverlight. Generating Excel files in ASP Classic is not as easy as I thought. I hope someone finds use in this little piece of code that shows a way to export data to csv and to xls. In my previous blogpost I mentioned a way to retrieve the entire tree from a hierarchy stored with adjacency tables. Now I’ve got a way to retrieve a random employee in an organisation. I use ORDER BY NEWID() to randomize the order and TOP 1 to get only one result. I’m well aware that adjacency tables aren’t the newest way of storing hierarchies in a database. Personally I prefer to use nested sets. But on this one project I had to work with a legacy database. It took me quite a while to find out how to retrieve an entire tree in one requests. This is obviously needed to speed up queries on large amounts of data. This query is here to help me remember how to do it. I had some issues today to change the background color of a button in Flex. The up-skin was set for the Button selector which meant setting the fill-colors property for the Button.special selector had no effect. Setting the up-skin to null was the only solution. This was easy to do in code with setStyle, but I wanted to do it in css. Writing null wasn’t quite enough. Apearently you need to use ClassReference(null). Hope this helps someone out.